While parents, staff and administrators are a part of the community, consider expanding marketing projects to target local business and government, and different departments within the city or local area. Explain how the Child Nutrition program promotes the city's goals and provides an important benefit to the community. Partner with city departments, such as libraries and Parks and Recreation. Businesses can provide sponsorships and grants for student events. The resources below include taking points for community members to help them understand the value of the Child Nutrition programs. One way to show the community the benefits of your program is to invite your local legislators to school meals. This is an opportunity to show them what you are doing to meet the challenges of the new regulations and what you do every day to prepare students for the classroom. For help with legislator site visits view the resources below. The new EatSmart2beSmart Web site is supported by the Southern California School Nutrition Association. 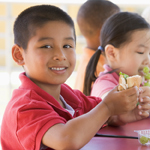 This chapter of the California School Nutrition Association developed the Web site to highlight the work they do to efficiently feed thousands of California School children every school day. Visit the site for guest blogs, recipes, resources, and more at EatSmart2beSmart.